On paper, it sounds like a game of food roulette that went a bit awry: Aussie restaurateurs bring small plates Japanese fusion cuisine to an unremarkable part of Marble Arch property developers insist on calling Connaught Village. Maybe that’s being a tad harsh, but let’s just say I wasn’t necessarily sold 100 per cent on the premise of my latest meal out. 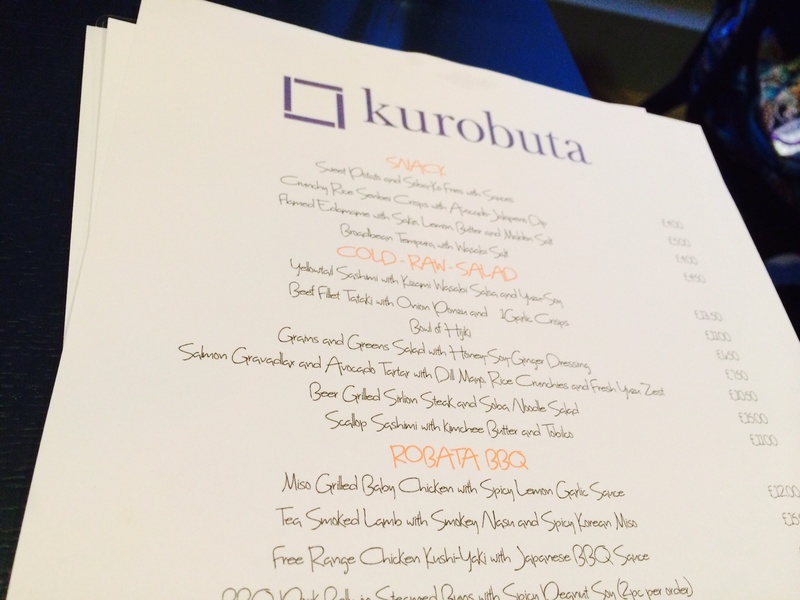 I had, however, heard lots of approving grunts about Kurobuta on social media, and a bit of digging revealed some fine CVs – Nobu, Bone Daddies and Flesh & Buns being among the cumulative credits – so I decided to put aside my unjust reservations and actually eat there. In the end, I was rather glad I did. Kurobuta is a fun, boisterous place that began life as a pop-up and models itself on Japanese pubs, or izakaya. 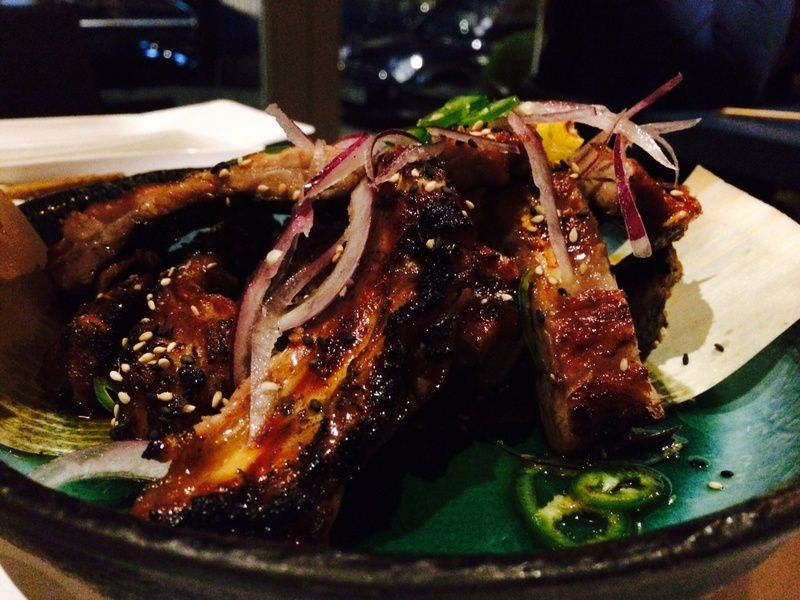 Its menu is a positively erection-inducing tour de force of fried things, raw things, and barbecued things – all three of which happen to be some of my very favourite types of ‘things’ to eat. The ambiance won’t be to everyone’s taste – it’s loud, very loud – but being the complete 90s cliché that I am, humming along to Kurobuta’s grungy soundtrack was part of the charm. Staff were exceptionally warm and very accommodating (we were late), if a bit slow and disorganised at times when it came to the actual service side of things. Nevermind. The food, while not universally perfect, was very good on the whole and a few bits were exceptional. 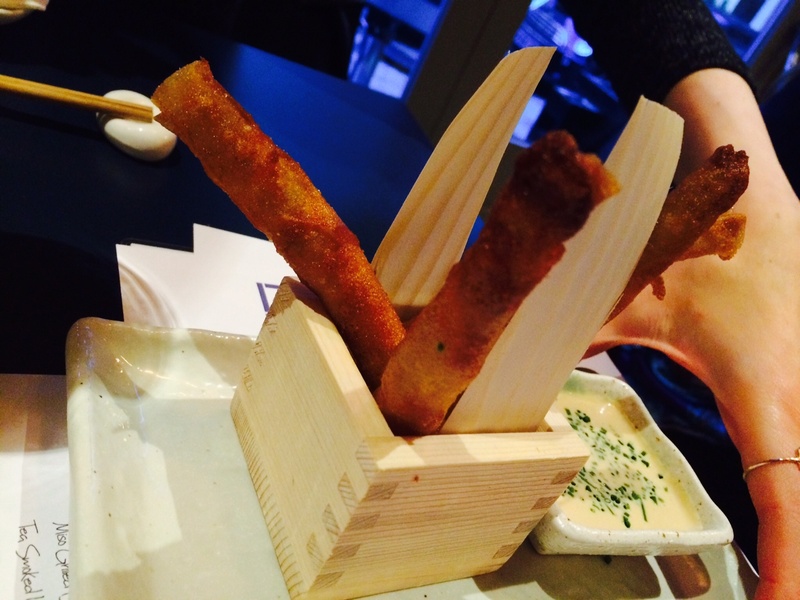 The very good-to-exceptional began with the first nibbles, Jerusalem artichoke ‘chopsticks’. Essentially Jerusalem artichoke chips, these were extremely moreish, as was the accompanying truffle ponzu dip. It was a shame you only got four (especially with a £7.50 price tag), but it was pay day and I was in a generally ebullient mood, so I cast this aside and just enjoyed them. 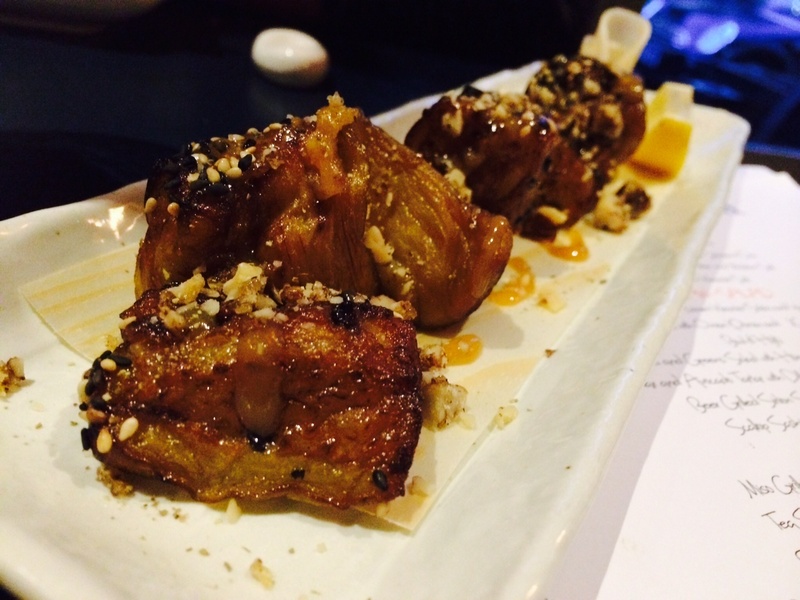 Nasu dengaku, or miso aubergine to you and I, was another out and out winner – all sticky, soft and sweet goodness with a nice nutty garnish to add some texture so you didn’t feel like you were eating the world’s best baby food. Kurobuta also offers a fair bit of sushi stuff, and based on my experience, I’d say it was worth paying a visit for this alone. 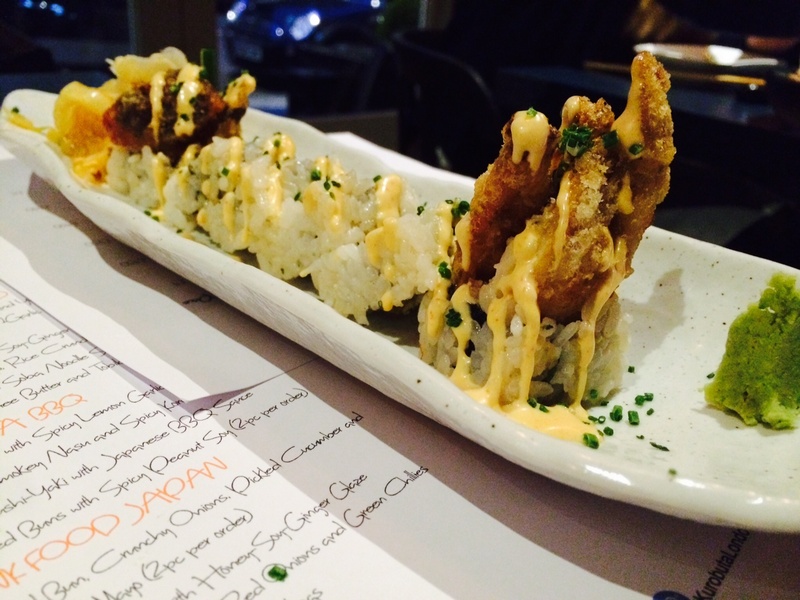 We sampled diver scallop nigiri and the soft shell crab rolls, both of which featured beautifully prepared fish and – just as importantly – meltingly warm and crumbly rice. Not quite threatening to dethrone The Shiori, perhaps, but still damn fine. The freshness of the yellowtail sashimi also impressed and those of us with slightly average chopstick skills (I include myself) will appreciate the way the fish comes courteously rolled up for easy handling. 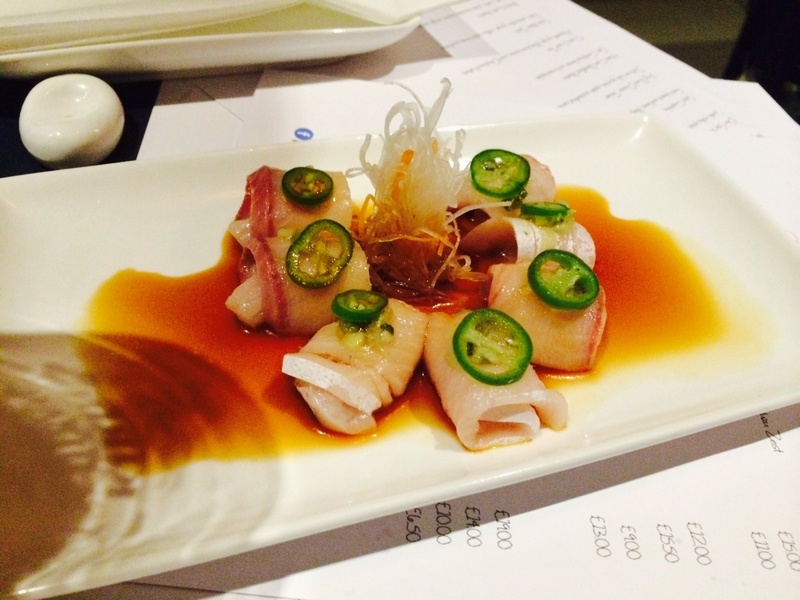 Squid kara age (which I forgot to snap) was another star, arriving greaseless in an intriguingly spiced light batter. I also swooned over its bedfellow, a beautifully punchy and tangy jalapeno dipping sauce. Not everything was perfect, though. The ribs came highly recommended by our waiter but weren’t particularly meaty, took a fair amount of gnawing at, and resulted in stringy bits left between the teeth. I’m aware this is (possibly) just the Asian style of ribs and I did enjoy the (un)healthy amount of char they received from the restaurant’s robata grill. Chicken wings were much better – meaty, tangy and quietly spicy, they could perhaps have been a bit crispier but were appropriately moist within, so these are but polite grumbles. Pleasingly, puddings took us back to the brink of the sublime. Artfully presented, these were seriously complex assemblies but ones that I found to be well balanced. 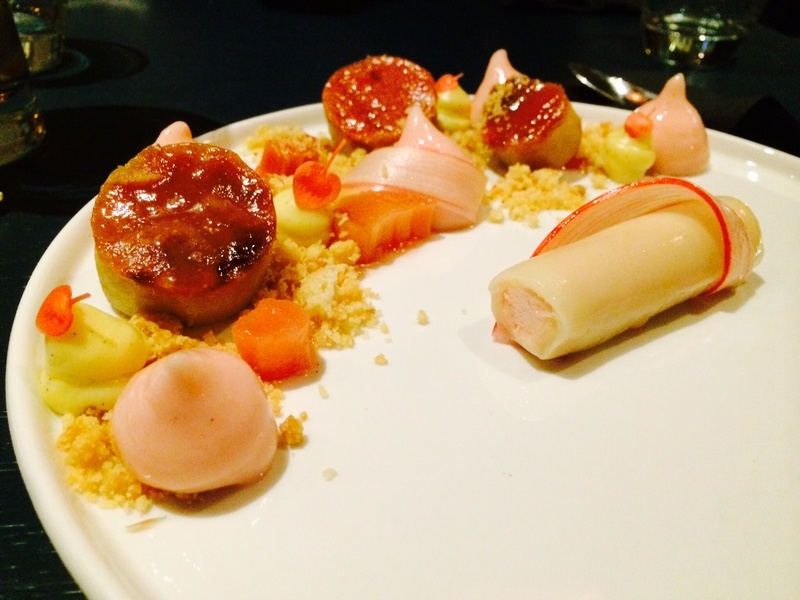 My Yorkshire rhubarb plate, for instance, had too many layers of texture to count, but still managed to work. There was chewy marzipan encasing a light rhubarb mousse (or similar); soft, faultlessly cooked rhubarb that was just verging on caramelised; spongey, bread-y bits (how’s that for gastronomic precision); more light, creamy stuff; and some crumble-like crunchy bits. Superb. 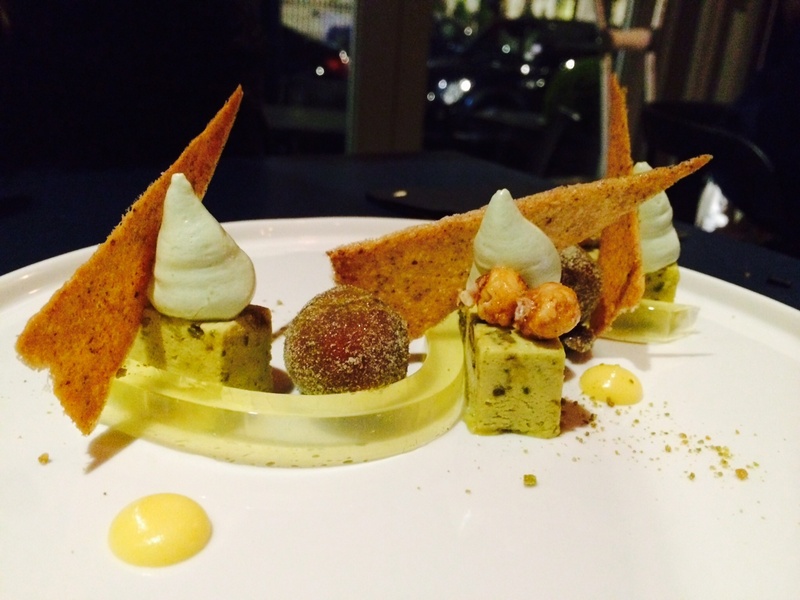 The pistachio and doughnut dish, which I was only allowed a soupcon of because it too was apparently pretty epic, featured a similarly enticing combination of cake-y bits, crunchy bits, soft bits, and a rather fun squiggle of limoncello jelly. Some sophisticated palates might have thought this all was over egging the pancake – I thought it was clever and rather pleasing. 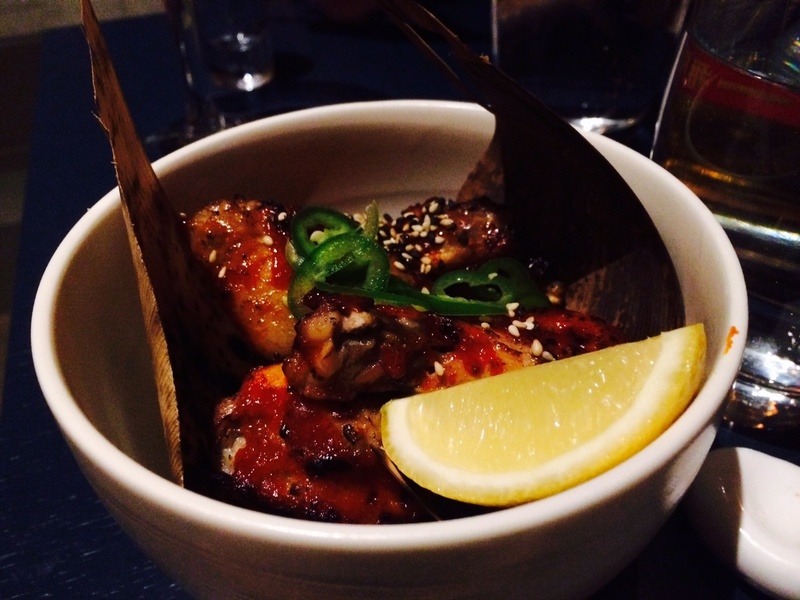 So despite early snooty misgivings, I thoroughly enjoyed myself at a Kurobuta – even when the enthusiastic bill came. Between two, we managed to knock back about £160 worth of stuff, though we could have gone easier on the drinks (two cocktails, both superb, and three skinfuls of the ‘frozen’ Kirin lager, which is quite fun) and did order a couple more plates than our server recommended. In the end, a pair of gluttons eating at small plates restaurant always carries a fiscal risk, and good Japanese food rarely comes cheap. So while I won’t say we necessarily found a bargain, but we did find a bloody good restaurant that we can’t wait to go back to.